Biopics can be risky. The fame of the actor can itself become a barrier to accepting them as the subject. Thankfully, this is not a problem Stan & Ollie suffers from. 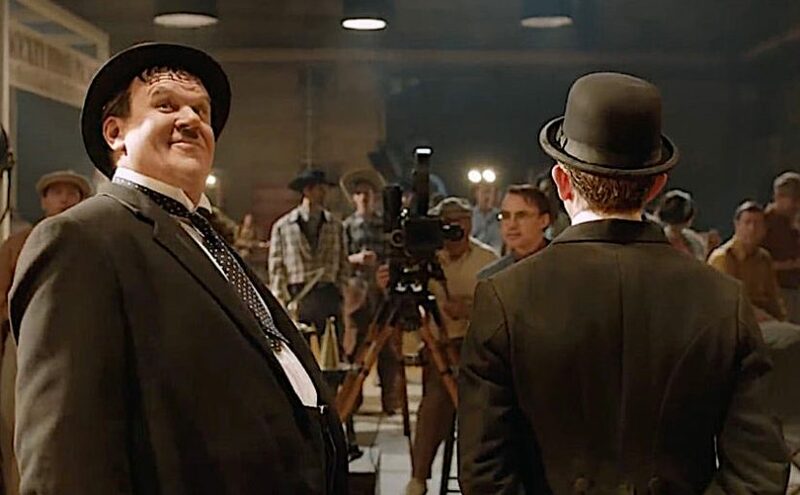 It probably helps that we’ve not seen a great deal of behind-the-scenes footage of the ‘real’ Laurel and Hardy. Mainly, though, it’s because the performances feel so uncannily accurate. It’s certainly a tall order to do justice to icons of this magnitude. For both Steve Coogan and John C. Reilly, then, this is another fine success. Coogan, a masterly impressionist whose work has transcended his roots in vocal mimicry, plays Stan Laurel in satisfyingly subtle style. An expert in gestural micro-tics, it’s a nuanced depiction of the man, not a caricature of his stage persona. Meanwhile Reilly is a gift to the casting agent on account of his facial similarity to Hardy, not to mention his well-honed comedy chops. He’s used to operating in a double act, of course, performing alongside the gleefully juvenile Will Ferrell in multiple movie outings before. A prosthetic piling on of the pounds adds …er, enormously, but the sum of all these parts is that he disappears, quite remarkably, into the role. It views like it’s really Coogan’s film though (it’s part-produced by his Baby Cow company, penned by the co-writer of their former hit Philomena, 2013). And this weighting works, because it feels like art mirroring life: the screenplay makes clear that it was Laurel who was the duo’s driving force, and endlessly creative with it. It is he who writes the material, comes up with the dialogue, and is ever-honing those lines to the point of obsession. Hardy (already an established comic actor by the time Hal Roach united them) was happy to fit in as Stan saw best. After a brief Way Out West-era prologue, we rejoin them in their later years, their heyday now way behind them. Touring the north of England, the threat of disappointing sales hangs over the entire run. It’s not long before the relationship is strained, and past grudges rear their head. So this is not a rip-roaring gag fest. It’s a touching, sweet portrayal of a personal bond that battled to survive the pressures of fading renown, exacerbated by the rigours of ageing. One of the core pleasures is that it takes the time to spotlight the full extent of some of their routines, whether it be a dance, a song, or a silent sequence. It puts the breathless acceleration of today’s attention-deficit entertainment into sharp focus, offering the rare treasure of sitting back and luxuriating in the steady pace and purity of a vaudevillian turn. Historical accuracy becomes the only question mark. It’s hard to believe that their celebrity status would have fallen to such a degree, even if their peak was over; they’re still sprinkling true Hollywood stardust over the music-hall backwaters of Britain. And while Coogan and Reilly are clearly younger than the duo were on that fateful tour, such pedantries don’t matter within such a loving tribute. It just feels so refreshing to see something this out-and-out …nice. The script pulls at the heartstrings, and while it strays close to the line of oversentimentality, it doesn’t step over it. This richly drawn testimonial is sure to reignite (or spark) interest in arguably the greatest of our comedy heroes, and it somehow feels timely that we need that reminder right now. Their influence is impossible to measure, and this is an emotive memento of that gift. Feels like today’s world could do with a laugh. Especially one that is this innocent and uncomplicated. To be savoured.